Home / News / News / Try Pork Carnitas in Your Pizza Oven! Try Pork Carnitas in Your Pizza Oven! 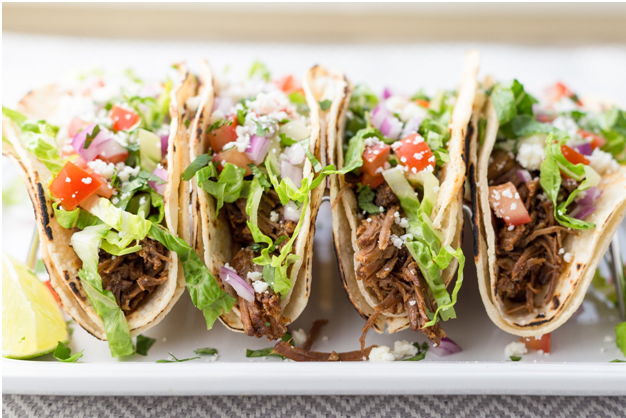 Carnitas, which literally translates to “little meats” is a traditional dish of Mexico in which a fatty cut of pork is slowly cooked in a spiced braising liquid and then quickly seared before serving, yielding a tender yet crispy delight. Try this recipe in your outdoor wood fired pizza oven and serve on corn tortillas with salsa, sour cream, avocado, cheese, and chopped coriander. Heat your wood pizza oven to 340°C. Rinse the pork shoulder and pat it dry. Mix the salt, pepper, oregano, cumin, chili powder, and olive oil in a small bowl. Rub the spice mix all over the pork and then place the pork fatty side up into a small roasting pan. In a bowl, mix the onion, jalapeno pepper, garlic, orange juice, lime juice and 1 cup of chicken stock. Pour the mixture over the pork. Cover the roasting pan tightly withfoil and place in the oven. Every 30 minutes, rotate the pan to ensure even cooking. The pork will need approximately 4 hours to cook. Be sure to check that the oven is maintaining a constant temperature of 340°C throughout the cook time. Around 2-3 hours into the cooking you will also need to check how much braising liquid is left—if low, add an additional 1-2 cups throughout the last couple hours of cooking. When the pork is done (be sure the internal temperature has reached 65°C), remove the pork from the pan and allow it to cool. Reserve the braising liquid. Once the pork has cooled, pull the pork apart with your fingers or use forks to more finely shred the meat. You should have 1-2 cups of braising liquid leftover from cooking the pork. If you have extra liquid, you can reduce it on the stove immediately after the pork has finished cooking. When the liquid has cooled, skim any fat off of the top. Preheat a cast iron skillet over high heat and add about 1 tablespoon of vegetable oil. Place a layer of pork in the skillet and let it sear for about 2 minutes, then add in some braising liquid to prevent the pork from drying out. Don’t stir the pork in the pan—the goal is to sear it on one side for added texture and flavour, but to keep the tenderness from the slow cooking. You may need to sear the pork in a few batches depending on the size of your skillet.